This is a reprint of an article I published in our local news paper last August, if you like it please pass it on to a friend, Thanks Trapper Ron. Fall is approaching at break neck speed and all urban wildlife will soon be looking for cozy places to spend the colder months. If you want to save yourself problems this winter, then it will be prudent to fill in all openings under decks and holes in the yard. It is also wise to check eaves and attic vents for any obvious openings and a quick inspection of the attic space for intrusions. Also, yard clean up of fallen fruit from trees, removing bird seed beneath bird feeders and securing outside trash cans can save you clean up time and damage from animals over the winter months. We spent hundreds of man hours this past spring and summer trapping animals as small as mice to animals as large as coyotes. Thankfully these hectic trapping seasons are winding to a close. This year the offspring population for skunks and raccoons seemed much larger than normal. Some of our clients who initally thought they had a skunk usually resulted in us trapping the mother skunk and as many as six little ones. 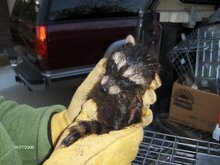 For the month of July we trapped over 75 skunks, over fifty raccoons, and dozens of other animals such as moles, coyotes, opossum, rats and mice. Many clients opted to have us install screening under their decks and porches. Personally, I am looking forward to the uncoming cooler months, since traditionally, the number of calls we receive should slow drastically. We usually get a break at the end of August and early September with calls increasing soon after. This time of year the larger animal calls subside and we tend to get calls related to bees hornets and wasps. In the last two weeks, we removed two very large hornet nests and we have appointments for two more removals next week. We are willing to assist anyone who needs help with these pests, but quite frankly, you can handle this pest yourself. There are many different varieties of these types of insects and the following removal technique will work for all of them. Your local hardware store should have products that deal with wasp and hornet nests. I have found that the sprays that produce a stream of foam work the best. For a large nest you will need at least 5 or 6 of the larger cans. Wait until the late evening or very early in the morning, this will ensure that the hive has most of the colony within the nest and they will be less active. It is best to wait until dark, however you should never shin a flash light at the hive since they will most likely fly directly towards the light. Trust me on this one, I learned this lesson a long time ago. Most of the insect sprays will have a stream of twelve to twenty feet. Shake the can very well and test spray at the hive. Once you have a full pressure stream, aim for the opening of the hive; usually located near the bottom of the hive. Use one full can for the opening and two full cans for the rest of the hive. The idea is to soak the hive thoroughly; this can be done by spraying the top of the hive slowly and letting the fluids seep into the hive from the top. Repeat this step over the course of a day or two. When you are satisfied that the hive is no longer active, you can cut it out of the tree or eaves. Leaving the hive should not be an option since the larvae on the inside of the hive will survive and can regenerate the population very quickly. Once the hive is removed place it in a plastic or paper lawn refuse bag, seal tightly and discard with you trash. If you need any advice or assistance, we are only a telephone call away are very happy to help. If you enjoyed this article and would like to recieve new articles each week, you can subscribe to my blog at WWW.TRAPPERRON.BLOGSPOT.COM. Effective immediately - Trapper Ron's Humane Animal Removal & Relocations Services we start taking appointments for the 2007 Goose Round-up slated for June. This year, we project, the goose population in Southeastern Michigan to be completely out of control. Last year the Michigan DNR trained our staff to handle the geese effectively and humanely. We have positioned our organization to handle any size goose population in any environment. The costs will vary depending on the senerio and size of the flock, however we feel that our services will be much more cost effective than our competitors. Our website has a page dedicated to our Goose Round-up http://trapperron.com/goose.html please feel free to take a look. While dating my wife, Kathy many years ago. I was invited to spend the evening with her and her parents to watch a movie at their home. The evening was going well; we had our sodas and popcorn, and a warm blanket to snuggle up with and the lights turned low. I don’t remember what we were watching but I do remember the rest of the eventful evening. Kathy’s parents had a den off of their living room with a door leading to their attached garage. While we were watching the movie Kathy insisted that she heard scratching sounds coming from the garage. At first we discarded her concerns and continued watching the movie. Kathy continued to insist that something was in the garage and the brave men of the house decided to investigate. We put the movie on pause and ventured into the garage. A quick inspection revealed nothing, with the exception of small animal footprints on a dust covered shelving unit near the door. After deciding that Kathy was hearing things, we continued with the movie. After a short while, she began to hear the scratching noises again. This time she took it upon herself to investigate. I cannot fully describe the look of horror on her face as she opened the door to the garage, or the screams of “It’s a huge rat”. Kathy slammed the door and while darting away from the door she shook with vile disgust. Meanwhile, hearing Kathy scream, I jumped up to see what had happened. To my disbelief a very large opossum was standing with its hind legs on the doorstep and its front paws holding itself upright against the screen door. It appeared to be looking into the house. At first glance the opossum did look very similar to a rat and after a second or two decided that it was in fact an opossum. Kathy’s father, bless his heart ran down the hall to a closet where he stored a shotgun. When he returned he attempted to load the gun, however his hands had a very nervous shake and he found it difficult to load the chamber. The chaos and excitement in the house that night was unbelievable, one minute we are watching a movie the next my future father-in-law had a shotgun in his hands. I suggested that he not shoot at the opossum since there were two very expensive cars parked in the garage. Chances were better than average the animal would be missed, and the bb’s from the shotgun shell would ricochet around the garage; the cars most likely, would get the worst of it. After everyone calmed down, Kathy’s father and I ventured into the garage armed with a golf club. The animal was under some boxes in the far end of the garage. I slowly approached the animal, not knowing how it would react. I could feel the hot breath of my future farther-in-law against the nap of my neck. I turned and asked him sarcastically if he would rather take the lead. He got the hint and backed up a couple of feet. We slowly continued to approach until I was close enough to reach it with the golf club. I gently poked at its rear end hoping it would move; instead it hissed at me and showed its teeth while staring at me with devilish red glowing eyes. After gaining a little more confidence, I gave it a couple more pokes and it finally decided to retreat. The opossum slowly waddled out of the now open main garage door never to be seen again. Looking back, I always had a knack for dealing with animals; I just didn’t realize it at the time. Over the years I have had many experiences, some funny, some very terrifying, all of which have helped me become the best professional trapper around. I will spend a lot of time over the coming winter months trapping and relocating nuisance animals, such as raccoons, opossum, skunks, rats, mice and, coyotes from property in the Farmington/Farmington Hills and surrounding areas. I wrote the following to emphasize that reasonable precautions and a simple maintenance chore this winter would help in dealing with and living with wildlife in our city and surrounding areas. Several weeks ago, my son, Erik and I were out fairly early in the morning checking our traps. It was a light day of trapping with several raccoons, two Skunks and an opossum neatly stored in the bed of my pickup truck. We had several hours before our next appointment so we stopped at a coffee shop for donuts-then headed for home. As we pulled into our driveway around 7:00am, I noticed my wife standing in her robe waiting for us. Kathy had been trying to get in touch with us for the last 45 minutes; unfortunately I had left my cell phone at home. After she let me know, in not so many words, how she had been woken up prematurely, she informed us of an emergency call that needed our attention. With an apology, the address, my cell phone, and our highly trained golden retriever Anna, we left for the emergency. Kathy had been sleeping when the phone rang at 6:15 am. The woman on the other end seemed very distraught and wanted assistance quickly. She explained that a very large raccoon had entered their home and was knocking things off of her cabinets. Kathy did her best to calm her down a told her that someone would be there within the hour. The home was easy to find since there was an elderly couple joyously flagging us down and directing us into their driveway. I told Erik to leave Anna in the truck until we needed her. We walked through front door armed with five-foot catchpoles. Catch poles are basically pipes with a cable noose on one end used to humanely and safely capture large animals. A quick scan of the room revealed multiple piles of broken glass and pottery. The homeowners explained that the raccoon had successfully destroyed 15 antique cookie jars that had been in their family for several generations. When we ventured deeper into the home we noticed, on top of a curio cabinet, a very large raccoon and it was not happy. I told Erik to go back to the truck and be ready with a transport cage. I approached the animal and slowly placed the noose of my catchpole over the head and neck. With a quick tug I had what felt like a 35-pound raccoon securely harnessed. It jumped about and flailed desperately trying to wedge itself behind the cabinet. The fight was futile for the raccoon and soon it gave up the struggle and submitted to my will-it was clearly under control. I dragged the raccoon outside to the open cage Erik had prepared and 30 seconds later we had it securely stowed with the other animals captured during the morning. Afterwards it was determined that the raccoon had crawled down the fireplace chimney sometime during the night and calmly walked out the fireplace opening into their living room. Fortunately the homeowners were home and not on vacation--the raccoon could have done significant damage to their property. This situation could have been avoided with one simple product - a chimney flue screen cap. Flue caps are covers that allow smoke to exit a chimney while preventing wildlife from gaining access to the home. They can be purchased from any hardware or home supply warehouse and most are reasonable in price. The advice that we give out most often is to secure all of your Chimney flues with covers. This is a simple maintenance task that can save you a potential headache. Unfortunately, in this case the loss of priceless family heirlooms and the heartache associated with their destruction should have never happened. Lately we have received calls regarding adolescent raccoons in attic spaces, under decks and in crawl spaces throughout the area. These animals were abandoned by the mother, possibly the mother was killed on the road or was trapped by a homeowner and relocated to a nearby park. This time of year when the adult raccoon is removed or relocated by a homeowner, they could be causing another unforeseen problem for themselves. Over the years I have accumulated story after story from experiences dealing with nuisance animals. The following is another story where homeowners thought they were solving a problem only to cause another. Not to long ago I received a call to help with a problem a resident was having. Apparently something was making scratching noises in their attic space and they needed someone to come and check it out. Over the phone they told me that they constantly see squirrels on their roof and wondered if one had made its way into their attic. Upon the arrival of our new client’s home, we noticed that the property was heavily wooded with several trees growing up against the house. My first mental note was to have the homeowner trim back the trees far enough to prevent animals from climbing up and jumping onto the roof. The homeowner greeted us outside and after an introduction and a few pleasantries; my attention turned to a large live trap in the garage. The homeowner explained that a couple of days ago, he was experiencing a problem with a raccoon stealing the grease drip pan from his barbecue grill. He had successfully trapped and relocated the problem raccoon to a nearby park. As he was telling me this, I could see the cartoon light bulb dimly lit over his head. He continued to explain that, a couple of days later he and his wife could hear meowing and scratching sounds in his attic. They feared there might be animals in their attic so they decided to call in a professional. As he concluded his story, at this point the light bulb was fully lit, he asked if it was possible that he removed a mother raccoon from babies in the attic. My thoughts exactly…. As my son, Erik and I lifted ourselves into the attic we noticed that the screen from a rotary roof fan had been chewed, mangled and laid on the insulation just below leaving an opening for animals to enter. Further inspection showed an unbelievable amount of raccoon feces spanning the entire attic area. Some feces looked dried and as if it had been there for several years. Mental note #2, all of this feces is a calling card for other Raccoons and the homeowner need to clean it up as quickly possible. were no animals visible. We sat in silence for a few minutes until we heard the faint meows of adolescent raccoons. After a more detailed search we located the two small animals. They were tucked deeply in one corner of the attic near the lowest point of the rafters and behind electrical wiring that had been chewed upon. Mental note #3, electrical wiring needs to be repaired before it becomes a fire hazard. I crawled on my belly, as close as I could; however I wasn’t able to reach them by hand. I tried to extract them with my catchpole only to have them disappear into the eaves. We decided to set live traps and wait it out. As we left for our next assignment, I was concerned if the raccoons possibly still nursing; would they be tempted to enter a trap with solid food. Several hours had passed when we received a call from the homeowner. They heard the trap set off and as instructed they called us on our mobile telephone. One down, one to go. A couple more hours later we had the second raccoon. Before we left I made several recommendations from all of my mental notes and other standard common sense suggestions to prevent future invasions. While driving away we determined that the adolescent raccoons had been without their mother, food (other than what was in the trap as bait) or water for at least 4 days. Erik and I decided to bring them home to re-hydrate them before releasing them back into the wild. It is very satisfying to us to be able to release these and all animals back into an environment conducive to their well-being. They were sent off well fed and well hydrated and most importantly they were released to experience a new world together. These two raccoons were very lucky, if the homeowners hadn’t heard them meowing; they would have soon died. The homeowners were equally as lucky, if the raccoons had gone un-noticed and died, the aroma from the decaying carcasses would have been overwhelming for at least a week. Never approach a wild animal including infant, adolescent or adults, unless you are 100 percent positive there is no danger. Even infant wild animals can cause serious damage to a finger or a hand. Spring is finally here and already many animals have come out of hibernation. The trapping business in general becomes very slow during the winter months. Early to mid-March shows a slow but steady increase in varmint sightings, skunk smells and calls for the removal of the nuisance animals. I will spend a lot of time over the coming months trapping and relocating nuisance animals, such as raccoons, opossum, skunks, rats, mice and Coyotes from property in the Farmington/Farmington Hills and surrounding areas. For those who are brave enough to capture a skunk on their own, live traps can be purchased at your local hardware store (Average Price about $45.00). Bait it accordingly, and wait for your skunk to be trapped. It may take a couple of days, and you may catch other animals in the process. Eventually you will trap the skunk or skunks in your area. I can tell you there is no greater feeling when you trap the animal that has caused your nose to turn. The problem comes after the animal is trapped--now what. So you think you saw a stray dog in your neighborhood, do not be so sure it could be a coyote. The average adult coyote stands about 20 inches at the shoulder and weighs roughly 35 pounds. A coyote has the general appearance of skinny German shepherd, having a narrow muzzle; large pointed ears and yellowish eyes. Coyotes are nocturnal creature’s typically venturing out between 11:00 PM and 5:00 AM; however, it is not uncommon to see them during the day. I spend a lot of time trapping and relocating nuisance animals, such as raccoons, opossum, skunks, rats, mice and Coyotes from property in the Farmington/Farmington Hills and surrounding areas. Concerned calls inquiring about the trapping and removal of coyotes have increased sharply for us from a year ago. The latest DNR estimates are that there are about 200 coyotes in Oakland County. I honesty believe there are a lot more coyotes than they predict prowling our neighborhoods. For the most part you may never see a coyote, however coyote sightings are increasing and the likelihood of you seeing one in the future is very possible. The coyote is one of the most adaptable creatures in the world. They are common in most rural area, but because of their secretive nature, few are seen. Efforts to control the coyote seem to have produced an animal that is extremely alert and wary, enabling it to survive in every county of the United States. Coyotes are very useful and necessary animals and should be treated with the respect due to wild predator. They are very effective at controlling the populations of many other varmint species such as: ground hogs, rabbits, squirrels, skunks and mice. The coyote becomes a problem when household pets are added to their diet. Dogs that are not contained may approach a coyote to investigate or attempt to chase it from its territory only to find it either outmatched or outnumbered. I was recently contracted to remove a problem coyote from a property in Farmington Hills because one of their dogs was attacked and killed by a local coyote. By obeying the leash law this incident could have been prevented, unfortunately the homeowners didn’t realize the danger for they’re pet until it was too late. Since the attack the coyote(s) have been spotted on a daily basis coming very close to their house, including the patio. There concern for their remaining pets was justified and we proceeded to remove the problem coyote(s). There are a few things to consider when coyotes are known to be in the area. 1) Do not keep pet food outdoors. 2) Keep trashcan lids on tight and store in your garage. 3) Keep household pets inside at night, Coyotes will prey on cats and small dogs. 4) Pick ripe fruit from trees and pick up fallen fruit. 5) Clean up areas around bird feeders. 6) Never try to feed a coyote! There have been no reports of coyotes attacking people in Michigan; however, incidents nationally are due to people feeding coyotes. 7) Inform your neighbors about the coyote(s) and recommend that they follow the same precautions. If you decide to remove the coyote yourself, you will need a live trap or snare. Your local hardware store may have live traps; however, the largest trap they will have is for a raccoon (Average Price about $45.00). Traps are sold for larger animals through larger trapping supply company’s (Average Price about $275.00+Shipping). There are a couple of problems with these traps. First, you will catch other animals while trying to capture you problem coyote. Secondly, where there is one coyote there are usually one or more in their area. Lastly, The problem comes after the animal is trapped— now what do you do? Snares are only to be used as a last resort and I would not recommend an amateur attempting to snare a coyote. Ultimately, I recommend using a professional trapper, one with large animal experience. If you decide to have a professional come out and review your situation, make sure they are insured and licensed with the Department of Natural Resources. There are a number of companies that will take care of trapping and removing small animals, make sure they are qualified and have experience trapping coyotes. Do your homework and make sure you know what are all of the costs associated with the services and if there are any guarantees. It all started about fifteen years ago in the driveway of my home in the City of Farmington. It was about 9:00 p.m. and my wife and I were attempting to remove the window sticker from our brand new full sized van we had just purchased. My wife, Kathy, insisted that I get rid if them for obvious reasons. I did not have a clue what to do, so I called the city for help. They said that as long as the animals were outside the home, they could not do anything. However, they did have a couple of live traps I could use, if I wanted to trap it myself. I have hunted and fished my whole life and I thought that trapping should be easy enough, so I went to the police station to borrow a trap. At the station, I talked with an officer while waiting for a trap to be brought out from a back storage room. He asked what I was trapping and I told him my story about the skunks. He just laughed and said, “Sounds like skunk fricassee to me”. I replied, “You mean I can shoot it once I trap it”. “No, you cannot shoot it, city ordinance does not allow someone to set off a firearm within the city”. Later that evening, I set up the live trap in the driveway near the area of my deck where the skunks had entered the night before. I did not know what to bait the trap with so I looked in the refrigerator. The only thing I could see that might work was hot dogs. I grabbed a couple and threw them into the trap. Early the next morning, I looked out my kitchen window and to my surprise; there was a very large skunk inside the live trap. My chest pumped up as I strutted down the hall to brag to my wife who was still sleeping. Many questions were running through my head; would it spray me, how far could it spray, how was I to get close to the cage, never mind opening the cage without being sprayed, and how and where do I take it. My father was still laughing when he arrived at my house; he was as clueless as I was on what to do. Fortunately, he owned a pickup truck and we could use it to move the trapped skunk. My father, Erik my oldest son, he must have been around 5 years old at the time, and I piled into the pickup for our adventure. We slowly drove to the nearest park since I did not want the tarp to blow off the cage. Once at the park, I took the trap and sat it on the ground away from my father, my son and the truck. We talked it over for a minute until I got the nerve to reach inside the tarp to unlatch the trap door. When the door was securely open, I ran from it as fast as could. We waited for five minutes and the skunk did not come out of the cage. After ten minutes, I walked up to the cage, gave it a light kick, and then ran. I was amazed that the skunk would not leave the cage. My father and I just looked at each other in puzzlement. Jokingly my father told me to go over and shake the skunk out of the cage. The look I gave him surely indicated that he was insane, but after waiting, another five minutes decided what the heck. I left my son by the truck and told him he was about to witness two grown men running from a small fury animal; we slowly approached the cage. I grabbed the rear end of the cage and tilted it so that the open end was pointing to the ground. The skunk still did not come out. I lifted the cage higher and still nothing.